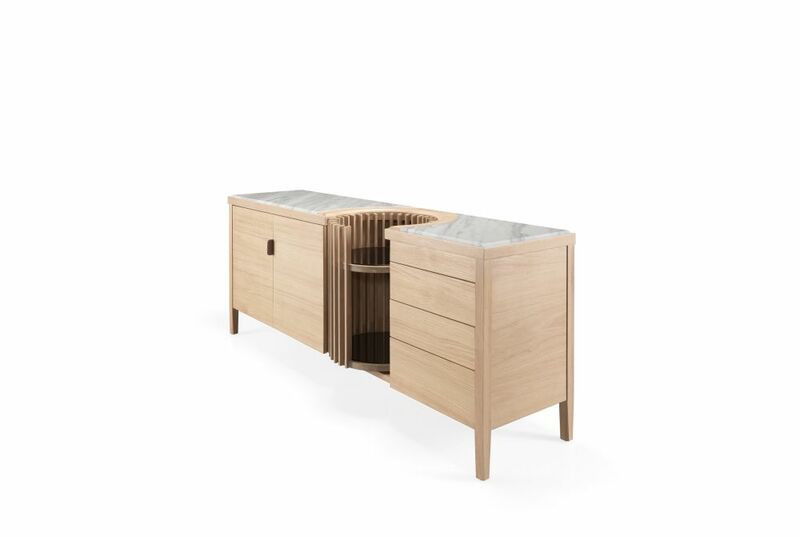 Carousel features two folding doors with internal wooden shelves and four drawers with tictac system, emphasizing the high quality of the materials and our skilled craftsmanship. The focal point of the sideboard is its turntable in the middle which can be used to put bottles and glasses of wine and whisky or the favorite objects more easily accessible. Available in several dimensions and options: three or four doors, with or without the carousel bar, in oak or walnut and the marble top in calacatta or emperor optional. Placing emphasis on functional propensities, this stunning sideboard was designed to address to various requirements as well as the need to incorporate luxurious finished in any environment. "Born in New Zealand, Leonhard Pfeifer studied industrial design in Australia and worked across a wide range of industries before establishing his design studio in east london. Since 2003 he has worked developing collections of furniture and stand alone pieces for design-led retail and contract markets across europe and internationally. Working across a range of design industries including consultancy, R&D and manufacturing, Pfeifer and his team have a wide scope of experience and a pragmatic approach to furniture design. The studio works globally with brands, retail partners and producers. Strongly influenced by notions of modernity and dedicated to an exploration of furniture in combination with innovative experiments in manufacturing, materials and structure, Pfeifer’s work follows pure and geometric form to produce minimal compositions with fine detail intrinsic to the work. Pfeifer brings an enquiring mind and novel perception, with his work recognised internationally. the studio currently holds three prestigious design guild marks."